Dayton Independent School Board Chairwoman Rosann Sharon knows the importance of students trying new foods. She was inspired to do the same when kale chips were served earlier this school year. She liked it so much she went back for more, and later bought some to make at home. Sharon, who taught math at Dayton High School for 32 years before retiring in 2008, is in her seventh year on the school board. She began volunteering at Lincoln Elementary four years ago. with Chef Sally Ayotte during Ayotte’s mobile chef visit. Dayton now has a salad bar, and plans for even more healthy options as part of the district’s involvement with Cook for America and Interact for Health. 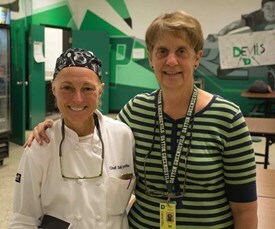 Sharon was at the high school for part of the groups’ Culinary Boot Camp in late July. She said after years of schools offering pre-made, heat-and-serve frozen foods, she is glad to see a return to schools cooking meals. In addition to teaching students why they should eat better, Sharon pointed out sometimes students need to learn how to eat some of the food items.